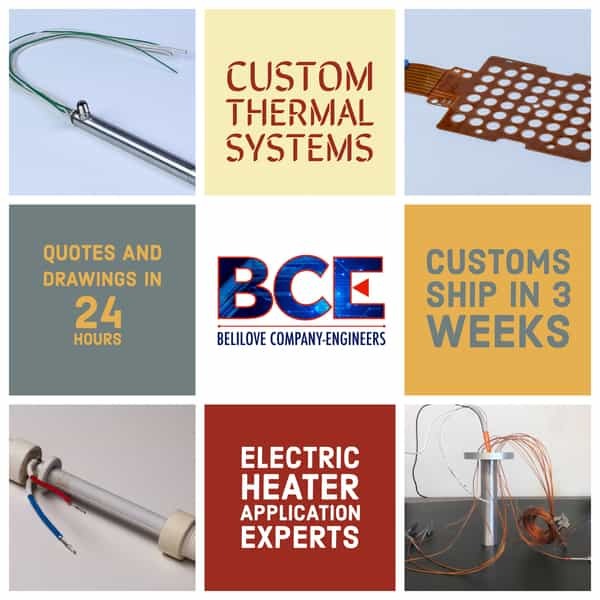 Belilove's Custom Thermal Heating group offers custom industrial electric heaters, controllers, and sensors. We bring our thermal expertise to many applications, including analytical instrumentation, semiconductor, photovoltaic, medical equipment, plastics processing, foodservice equipment, packaging, aerospace and other industries. Maintaining a high flow rate of cold propellants and optimizing flow in space launches. For electron ionization in the gas chromatography and mass spectrometry industry. Atmospheric pressure chemical ionization (APCI) heaters. Electric heating element used in purging systems for nitrogen dosers. High performance, fast response, electric heaters in a low mass, low profile package. CeraWatt, 800°C Heater; High gas flow temperature; no metal exposure. Liquid heater with fast, highly efficient heat transfer. Designed for immersion in fluids or high humidity.